Offit Kurman Attorneys At Law is a dynamic legal services provider assisting clients throughout the Philadelphia area.Our firm is well positioned to meet the legal needs of dynamic businesses and the people who own and operate them. From I-95 North (Crossing into PA): Take Exit 13 to merge onto PA-291 E toward I-76 W/Valley Forge. Turn left at S. 26th Street and take the ramp onto I-76 West. Take exit 345 toward 30th Street and turn right at Market Street. The Market Street office building is located on the left. Take I-95 South toward Pennsylvania, then take Exit 22, Route 676 West/US-30. Merge onto Vine Street Expressway and continue onto Route 676. Take the Exit toward Ben Franklin Parkway. Turn right at N. 22nd Street. Take the first right onto Benjamin Franklin Parkway. At the traffic circle, take the first exit onto N. 19th Street. Next, turn left at Market Street. 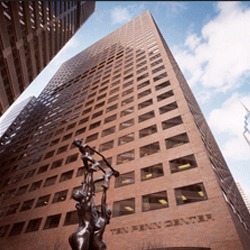 The Market Street office building is located on the left.